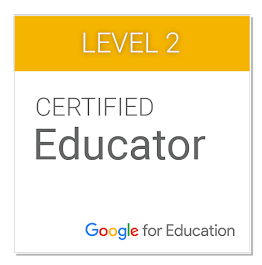 I have been working in first grade for the last few months. We did an animal unit that incorporated CCSS ELA standards and technology. This particular classroom has iPad minis. 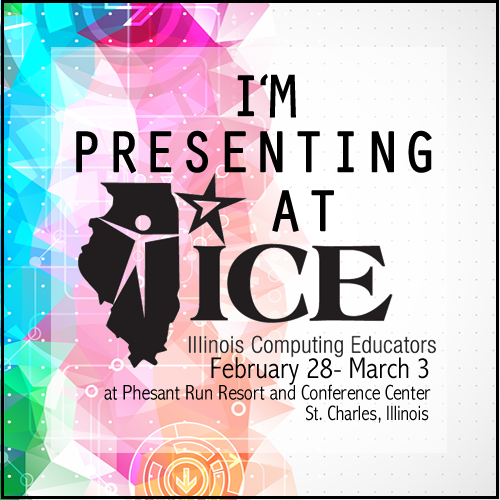 It is hard to believe that the teacher +Julianne LaFleur has only had iPads since we returned from winter break. Julianne has so many great ideas. We had to really narrow them down to get started. She also worked with the Literacy Coach in the building +Leah O'Donnell. Leah got us started. She came in to model close reading of a picture for the class. Students then went back to their seats in groups by animal and wrote down the very specific things that they saw in the picture. The picture on the SMART Board is a red tree frog. As an example, students would write down - two large red eyes. We encouraged them to use adjectives and not to assume things that were not seen in the picture. For instance, we did not want them to say frogs hop. You can't see that happening in the picture. It was great to have Leah there with us. This project truly was a team effort. I look forward to working with the literacy coaches in the buildings on a more regular basis! Here is the link to Leah's blog. 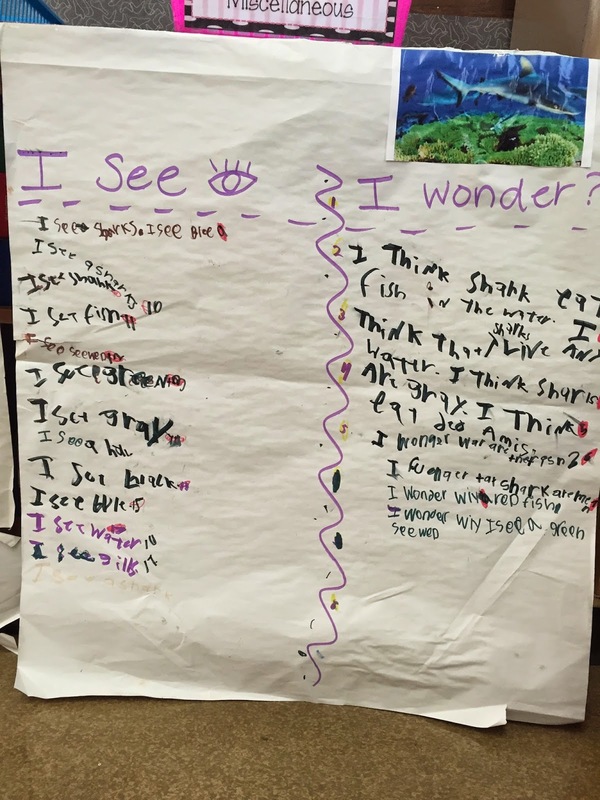 Students made an I see/ I wonder chart to get them thinking and give them questions to research. It's also a common core standard. We chose to focus on sharks, zebras, gorillas, pandas and walruses. 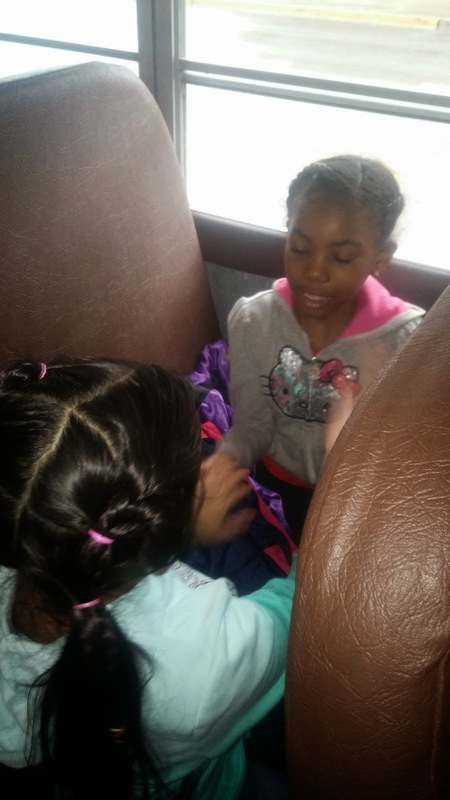 Since they are 1st graders Miss LaFleur gave them some direction. Our areas of concentration, which are evident in the Touchcasts, were characteristics (what do they look like? ), diet (what do they eat? ), habitat (where do they live? ), family survival (how does the mother care for the babies or how do they work as a family unit?) and fun fact (something they didn't know before). Then each animal had one questions specific to it as well. The gorilla specific question was, why does the silver back pound on his chest. Ms. LaFleur with the help of Mrs. O'Donnell set up Blendspaces. 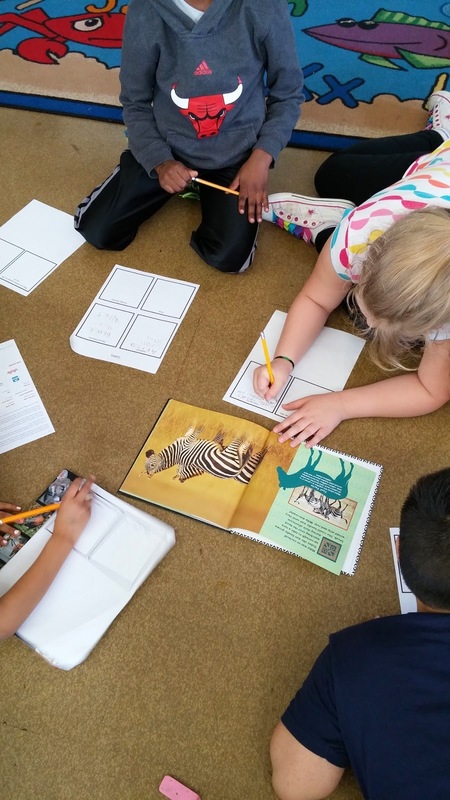 The blendspaces were used to help students learn to do research on characteristics, diet, habitat, family survival and the animal specific question. They viewed each Blendspace through one of these lenses in order to know how do their research. Blendspaces are a great platform for sharing different multimedia resources! Next, I flooded the classroom with fiction and non-fiction texts about the animals that were chosen. I also brought in biome/habitat books from the public library for the students to use. The school librarian also brought us everything that she had. We used those books and myON digital reading platform for students to do their research. As we did research we continued to emphasize finding information using non-fiction text features. We are lucky to live near the Brookfield Zoo, so we took a field trip. We were able to see a few of the animals on our list, and talk about our focus areas while standing in front of the animals. The kids had a great time at the zoo. We also did one of the Zoo's programs that talked about the characteristics of the five groups of vertebrates (amphibians, birds, fish, mammals and reptiles). Ms. LaFleur did some prep work for that and the students did a great job in the class talking about the characteristics of the different groups and what makes them alike and different. It was at this point that we needed to decide how the final product was going to look. 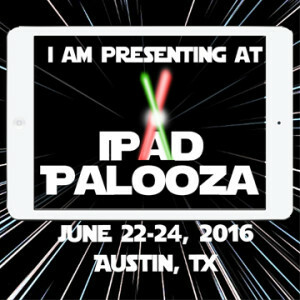 Ms. LaFleur had started Keynotes on the iPad with the students, but she was not happy with them. She soon scrapped that idea as the way to share out the final product. I was actually pushing for Book Creator, but the class had already used it quite a bit in the last few months to make projects. We both agreed we wanted something different. That's when I suggested Touchcast. Ms. LaFleur took a look at it and was instantly swayed. It is so versatile. If you have never tried either app you really need to download them on your iPad. They are my two favorite content creation apps. Touchcasts are built on an iPad, but they are viewable through any web browser. 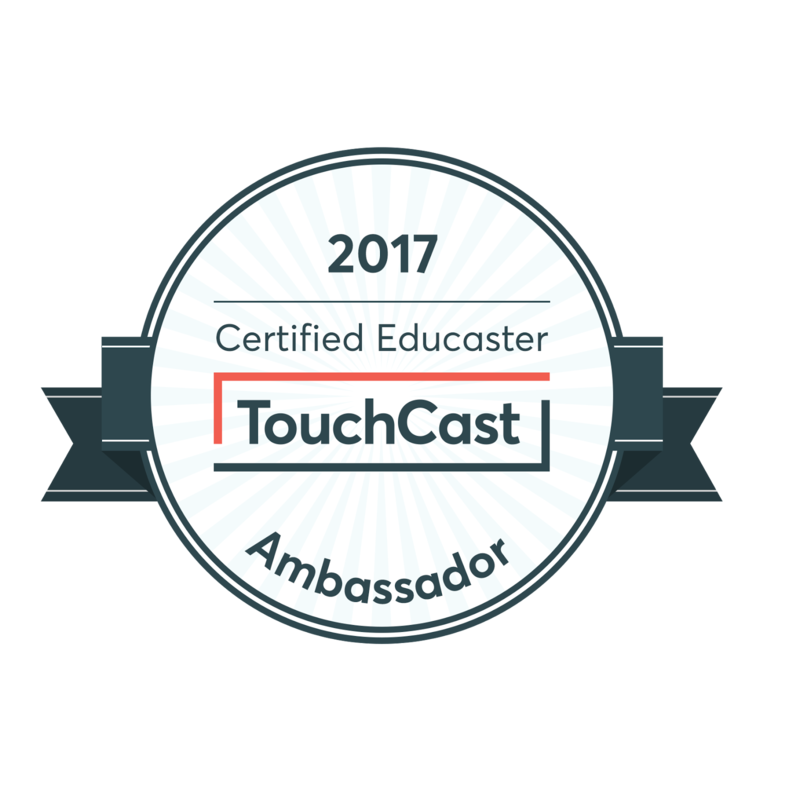 Here is a link to Touchcast training videos for educators. Next each student worked independently to create their own scripts in order to share out the knowledge that they had about their animal. 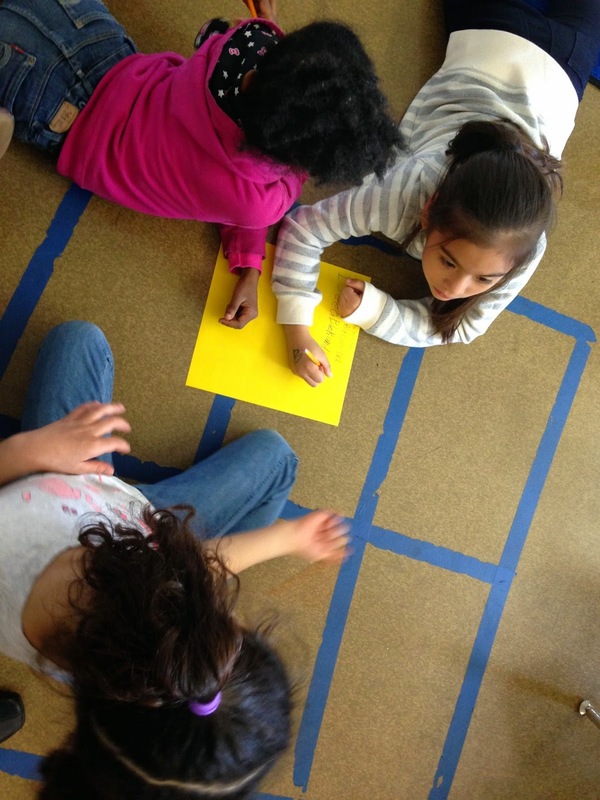 We took the scripts and had each group make one master script for their group. Part of that exercise was to get them to see what was most important. They negotiated with their group the top three facts from each category and wrote them down on the master script. I think one of the best things we did was not have the students memorize the scripts. First of all, that is a huge undertaking for a 1st grader and second of all, it made each Touchcast very unique. You hear some of the same facts, but they each put their own spin on it! Next we used the Image Searcher app to find pictures for the Vapps portion of their Touchcasts. I like this app but would like to find a better one for next year. Vapps are things that you can add to your Touchcast like, a map, stock updates, social media handles, and many many more. I gave the students about a 6-7 minute overview of the app and then we let them have what I call "sandbox time". 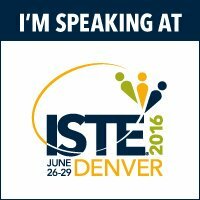 Some teachers also call it test driving the app. This where they can test out and play with the different features in an app. This is where we encourage them to make mistakes, to create and recreate. This lasted about 25 mins. This is an important part of the process. Make sure you give your students this time. We decided that we were going to use the school's green screen so that the students could actually tell us their facts as if they were standing in the animal's habitat. 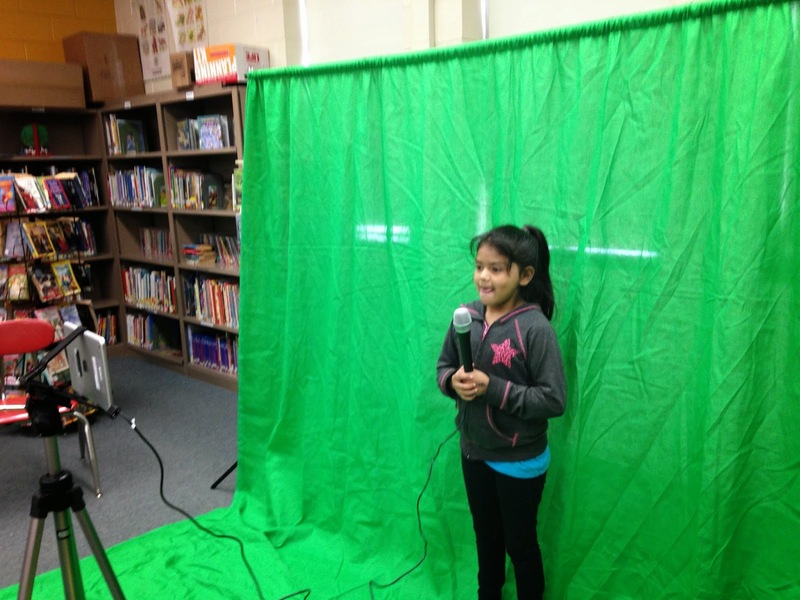 We set up the green screen in the school's library, but it could have been set up in a corner of the classroom. It was nice for me to be able to pull the students out of class to complete the Touchcasts. 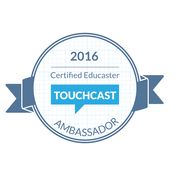 Here is a bit of information about setting up and using Touchcast. As stated we used a green screen. We also used a iRig Microphone to capture the sound and a tripod that held the student's iPad minis. There are many out there to choose from. I'm not crazy about the one I bought, so I am not going to link to it here. We used the CAST side of the app. We added the GREEN SCREEN effect. We added Titles. Finally, we added Photo Vapps. As you can see I sat on a chair just next to the iPad. I had students build the entire presentation. I had them practice one time before I pressed record. I prefaced it with "Tell us where you are" and "When this picture pops up what are you going to say about characteristics or food, etc". I pressed the photo Vapps, so that the photos would pop up during the presentation and students could concentrate on telling what they learned during the project. I wish there was a way to save and share out the flubs. They were so cute. For our friends who were really nervous or had a hard time with sharing all that information we used an interview style. Ms. LaFleur joined us in the library during her planning period or had the co-teacher cover. We knew that the students learned the information. It was just a matter of getting it out of them. Just because they couldn't do it totally independently doesn't mean they didn't learn something. Substitution - The technology acts as direct tool substitute, with no functional change - Doing the research using the myON digital reading platform - if used without the sound. Augmentation - The technology acts as a direct tool substitute with functional improvement - Doing the research using the myON digital reading platform - with the book being read to the students and the use of the image searcher app. They would never have been able to look through thousands of pictures to find just the right one for them. Also using Blendspace as a repository for all digital multimedia content. Modification - The technology allows for significant task redesign - recording their projects in the Touchcast app. 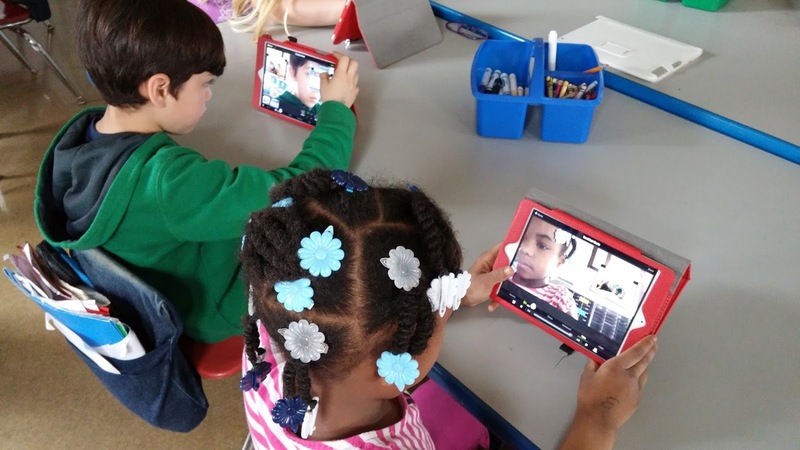 Redefinition - The technology allows for the creation of new tasks previously inconceivable - the immediate feedback possible by sharing out the Touchcasts on this blog and on Ms. LaFleur's blog. 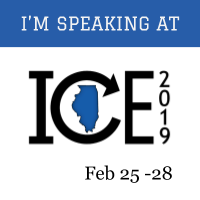 There was interest by the Brookfield Zoo and Touchcast Education division on Twitter about the process of completing this project. 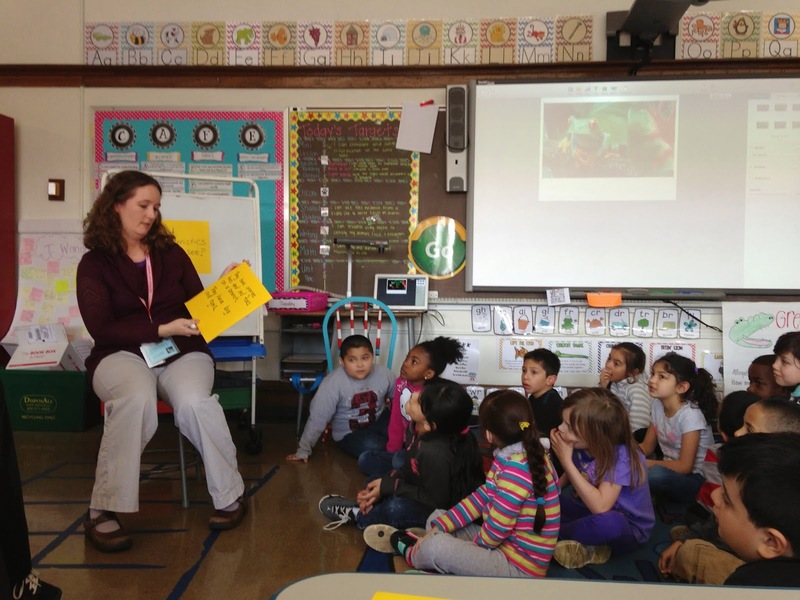 CCSS.ELA-LITERACY.RI.1.1 - Ask and answer questions about key details in a text. CCSS.ELA-LITERACY.RI.1.2 - Identify the main topic and retell key details of a text. CCSS.ELA-LITERACY.RI.1.4 - Ask and answer questions to help determine or clarify the meaning of words and phrases in a text. CCSS.ELA-LITERACY.RI.1.5 - Know and use various text features (e.g., headings, tables of contents, glossaries, electronic menus, icons) to locate key facts or information in a text. 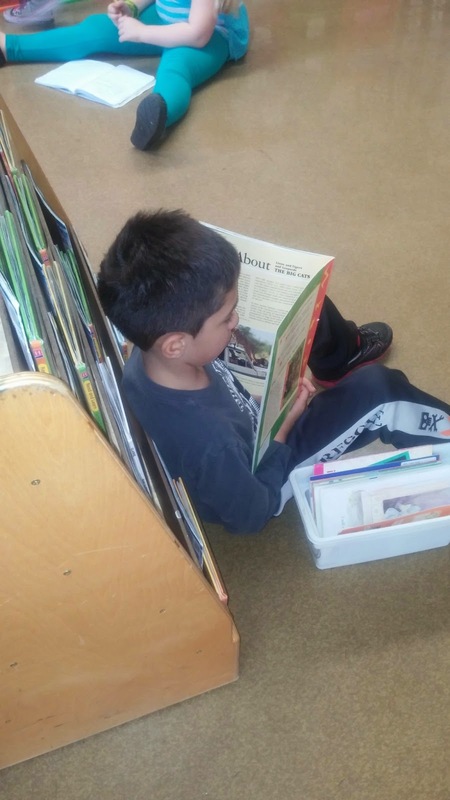 CCSS.ELA-LITERACY.RI.1.6 - Distinguish between information provided by pictures or other illustrations and information provided by the words in a text. CCSS.ELA-LITERACY.W.1.2 - Write informative/explanatory texts in which they name a topic, supply some facts about the topic, and provide some sense of closure. CCSS.ELA-LITERACY.W.1.5 - With guidance and support from adults, focus on a topic, respond to questions and suggestions from peers, and add details to strengthen writing as needed. CCSS.ELA-LITERACY.L.1.1 - Demonstrate command of the conventions of standard English grammar and usage when writing or speaking. CCSS.ELA-LITERACY.L.1.2 - Demonstrate command of the conventions of standard English capitalization, punctuation, and spelling when writing. CCSS.ELA-LITERACY.L.1.4 - Determine or clarify the meaning of unknown and multiple-meaning words and phrases based on grade 1 reading and content, choosing flexibly from an array of strategies. 1-LS1-2 - Read texts and use media to determine patterns in behavior of parents and offspring that help offspring survive. I had so much fun working with Ms. LaFleur and her talented students! This is the iMovie I made for the class to say goodbye and document the entire process visually. Enjoy!